In this section, you’ll find a description of the CLWSC water sources, the annual Consumer Confidence Report, and information to help you identify and take action on common water quality issues. 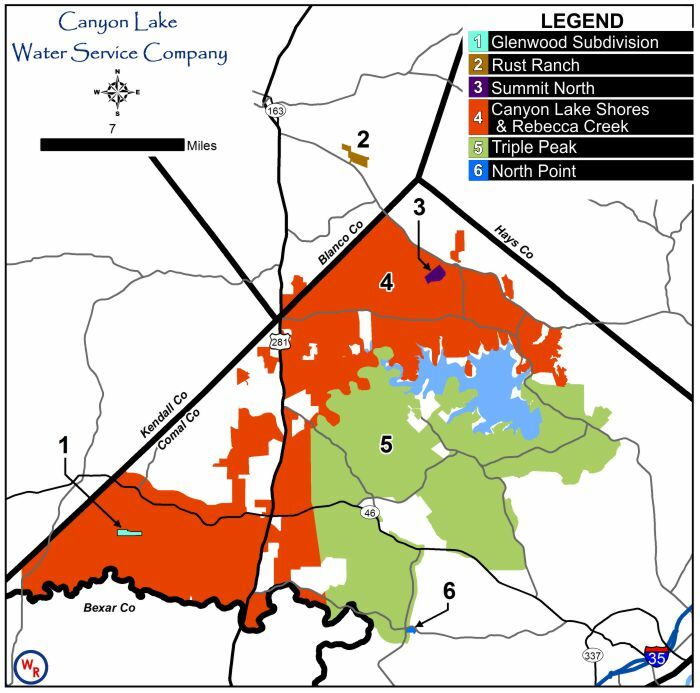 Your water source from CLWSC is a combination of surface water from Canyon Lake and groundwater from the Trinity Aquifer. These sources are often blended together in the distribution system. You may receive different sources from day to day as customer usage changes. Canyon Lake is operated by the U.S. Army Corps of Engineers to provide flood damage reduction to the Guadalupe River Basin and offer recreation opportunities in Texas. For more information about the lake level, which influences CLWSC’s drought stage implementation, visit the National Oceanic and Atmospheric Association page for Canyon Lake. CLWSC utilizes almost 40 active wells to supply groundwater to customers. Groundwater is helpful from a water quality perspective because it does not contain the amount of organic material and some contaminants seen in the surface water, so it does not require filtration, only disinfection. CLWSC also works with and reports to Groundwater Conservation Districts (GCDs) to ensure that this source is used efficiently, and that waste is prevented. For more specific information about your source of supply, please contact us. The Consumer Confidence Report (CCR) is a document that provides consumers with information about the quality of drinking water in an easy to read format. The CCR summarizes information that CLWSC already collects to comply with Federal and State (TCEQ) regulations. Click on the link below to access the Consumer Confidence Report associated with your water system. Recent news stories have called into question testing procedures for lead and other contaminants in drinking water across the country. In response, the American Water Works Association and the Water Research Foundation have put together some helpful information about lead and copper in drinking water. This information can be accessed at http://www.waterrf.org/resources/NewsletterStories/Lead.html. We would like to assure our customers that CLWSC complies with all requirements to prevent contamination of our water from lead, copper, and all other regulated contaminants. These requirements include the use of lead free materials for all distribution system hardware. The US EPA and the Texas Commission on Environmental Quality (TCEQ) regulate the testing and concentration of lead and copper to ensure that the water served to our customers meets drinking water standards. TCEQ establishes the Lead and Copper sampling schedules based on individual system requirements. Sampling for Lead and Copper is usually performed every three years throughout the distribution system by our customers; following the most recent set of guidelines provided by the EPA. These samples are processed by an independent certified laboratory. If you are interested in participating in the next round of our lead and copper sampling and testing program, please contact CLWSC. We have found that even the highest lead levels in our distribution system(s) remain well below the Regulatory Action Level of 15 ppb (parts per billion or the equivalent of 15 pennies in $10 million). The results of the most recent round of sampling can be found on the CLWSC Consumer Confidence Report(s). CLWSC is responsible for delivering safe potable water to our customers that meet or exceeds drinking water standards. The Texas Commission on Environmental Quality (TCEQ) requires routine main line flushing as a method of protecting water quality. Flush Points are strategically placed in areas that regularly require additional flushing and at the end of main lines. CLWSC staff routinely flushes the system from manual flush points in addition to automatic flushing devices that are being added in new developments and others areas throughout the distribution system as needed. Enhances success in maintaining consistent Chlorine levels. Adequately relieves air and sediment in the pipe. Prevents water from becoming stagnant in the pipe. Regulatory compliance. Adequate flow for fire protection. CLWSC recognizes that on the surface flushing the main appears to be a waste of water especially in times of drought. In order to minimize the volume of water we flush calculations are made to determine the rate of flow and length of time required to adequately flush the main. To minimize waste CLWSC will offer the water to be flushed to individuals and businesses that may have a need and the ability to transport water for non-potable use. CLWSC staff flushes fire hydrants periodically to verify flow rates and mains after leak repairs. 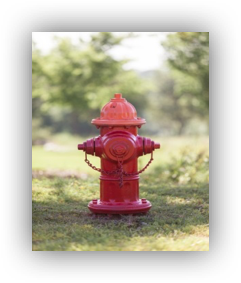 Locate Fire Departments also routinely flush through fire hydrants while performing routine hydrant testing and through firefighting purposes. After repairs are made to the distribution system, CLWSC field staff flush the main lines to relieve air and sediment which may have become trapped in the lines during repairs. However, there are times that additional flushing may be needed. If you experience air and or sediment in your lines, please reference the Quick Reference Guide for Common Water Quality Issues before contacting CLWSC to flush the main lines. Black Particles Internally activated in-line charcoal filter By-pass filter and call a service company. White or Light colored sediment Hard water (calcium carbonate will precipitate when heated or frozen) Flush water heater regularly, every 6 months, to remove loose calcium carbonate. Low Pressure Multiple factors can cause low pressure. See our Quick Reference Guide for Common Water Pressure Issues page for complete list of possible causes and solutions. What causes color and sediment in my water? Color and sediment are generally caused by the Customer’s service line or internal plumbing. However, occasionally, they may occur after a water main repair. If this happens, flush the line by turning on the water (low flow) at the faucet the furthest away from the meter for approximately ten (10) minutes. If the problem persists after flushing please refer to our Quick Reference Guide for Common Water Quality Issues to determine the possible cause and solution before contacting Customer Service. Disinfection byproducts such as Trihalomethanes (TTHM) and Haloacetic Acids (HAA5) are formed when chlorine is added to drinking water during the water treatment process. The chlorine, in addition to destroying disease-causing organisms, reacts with naturally occurring organic matter (dissolved leaves and other vegetation) to produce disinfection byproducts. Disinfection byproduct formation continues as long as the water remains in contact with chlorine. Customers may see CLWSC Operators flushing water mains to reduce TTHM’s and HAA concentrations and keep water safe for our Customers. For more information on this subject, you can contact the EPA Safe Water Drinking Hotline at 1-800-426-4791. What causes the taste and odor I sometimes notice in my water? CLWSC uses chlorine to disinfect the water which may produce a detectable taste and odor in the water. Other tastes and odor issues are due to the use of ground water and the natural minerals found in ground water. 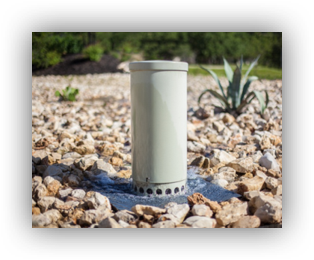 Although CLWSC utilizes surface water from Canyon Reservoir for over 55% of its water supply, taste and odor from the use of ground water can easily be solved with the use of an inexpensive water filter that attaches to the faucet inside the home or business. Does CLWSC water contain fluoride? CLWSC does not fluoridate its water. Fluoride occurs from erosion of natural deposits and is mostly found in our ground water supply. However, surface water may contain trace amounts of fluoride. TCEQ has set the maximum level allowed in a public water system at four (4) parts per million gallons. Please refer to the Consumer Confidence Report for your location to determine the level of fluoride detected. People are allowed to swim and go boating in our reservoir. Should I worry about this? Although the swimmers and boats do add some pollution, when this pollution is diluted by all the water that is in the lake or reservoir, it usually doesn’t amount to much. In addition, because the water is thoroughly treated before it comes to you, any contamination will have been removed. Fires, litter, and storm water runoff can cause far more trouble than this kind of pollution.